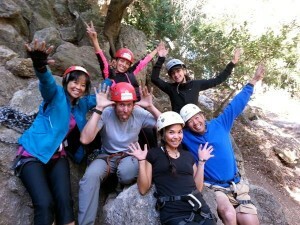 Outdoor Adventure Club- Rock Climbing, Private Trips and Courses in Bay Area, Castle Rock, Cragmont and Pinnacles. If you can’t wait for the next rock climbing trip, you are looking for some one-on-one instruction, or want to arrange a day on the rock for your group, you can hire an Outdoor Adventure Club rock climbing guide, year round. Whether you’re looking to climb for the first time, or are looking for some specialized skills, we can put a program together just for you or your group. Never climbed before? Want your own Gear & Anchor class? You and your climbing partner want a personalized self rescue course? Want to practice leading but don’t know where to go? The OAC guides can make it happen for you. There are many benefits of hiring a private guide. You get a program tailored to your experience and skill level, you get very personal attention, and you get more climbing in than you would with a group. Your Outdoor Adventure Club guide will provide all the necessary equipment for the day; you just need to bring your lunch and water. Climbing trips are routinely led in Castle Rock State Park, near San Jose, Pinnacles National Monument, near Hollister, Mt. Diablo, and Cragmont, in Berkeley. We can even introduce you to granite crack climbing at Consumnes, near Placerville. Give us a call to see about other areas. Private lessons are available mid-week or on weekends, based on guide availability. It is highly recommended that you make reservations at least one week in advance, farther is encouraged. Why climb with the Outdoor Adventure Club? In a word, or four, we are professional guides. We’ve been teaching the Bay Area to climb since 1996. You are spending the day with a guide trained by the American Mountain Guides Association, and certified as Wilderness First Responders. Unlike some “adventure” groups, we don’t contract out our climbing. We are your guides. Our focus is not only on taking you out and letting you climb, but setting up the safest climbing situations, and teaching you in a very patient, supportive and friendly manner. Besides safety, OAC guides are knowledgeable of the climbing scene, and eager to help you develop your climbing skills. Also, unlike other outfitters, we climb all day until you decide you are done. We don’t set a time limit on our days. Full Day Private Guide for 1-2 people: $400 (that would be $400 for one person; $200/person for two people), each additional participant up to 6 people is an additional $85/person. Multi-day trips with overnight camping are also available! Just let us know. Pricing is available on request. Want information on all of our rock climbing trips? Check out our full Rock Climbing Program. To inquire or schedule a private rock climbing trip, contact us below or give us a call at 415-377-1195. Let us know if you have any dates in mind, location preferences, number of climbers, and goals/objectives for the day.